Less than a year ago, the Hubble Space Telescope’s Wide Field Camera 3 captured an amazing image – a giant lensed galaxy arc. 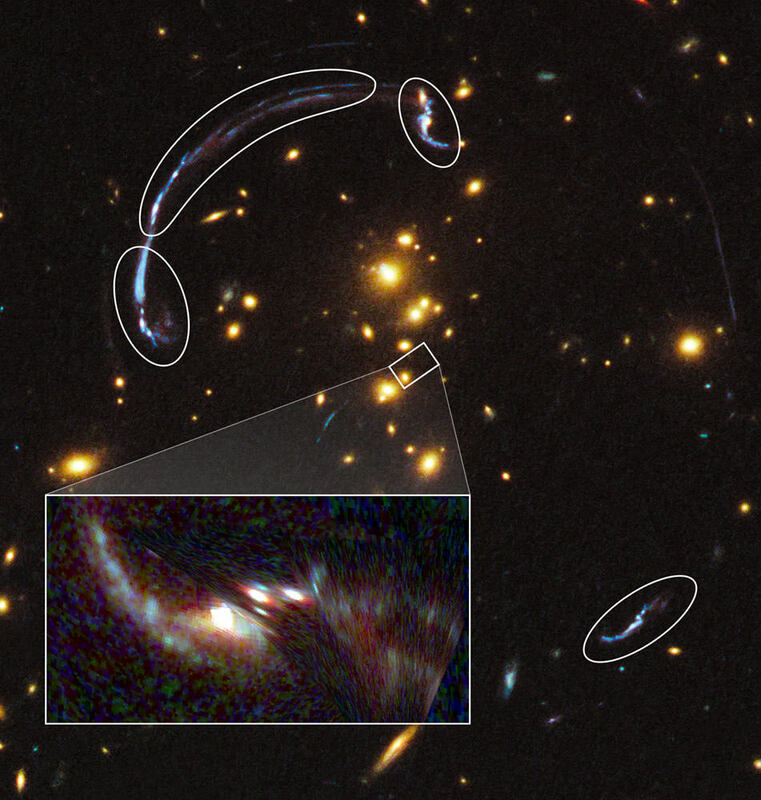 Gravitational lensing produces a natural “zoom” to observations and this is a look at one of the brightest distant galaxies so far known. Located some 10 billion light years away, the galaxy has been magnified as a nearly 90-degree arc of light against the galaxy cluster RCS2 032727-132623 – which is only half the distance. In this unusual case, the background galaxy is over three times brighter than typically lensed galaxies… and a unique look back in time as to what a powerful star-forming galaxy looked like when the Universe was only about one third its present age. A team of astronomers led by Jane Rigby of NASA’s Goddard Space Flight Center in Greenbelt, Maryland are the parties responsible for this incredible look back into time. It is one of the most detailed looks at an incredibly distant object to date and their results have been accepted for publication in The Astrophysical Journal, in a paper led by Keren Sharon of the Kavli Institute for Cosmological Physics at the University of Chicago. Professor Michael Gladders and graduate student Eva Wuyts of the University of Chicago were also key team members. 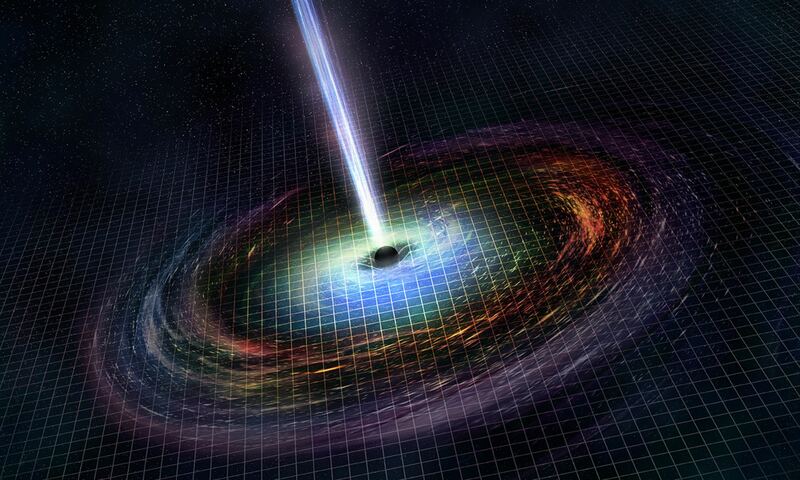 But the Hubble isn’t the only eye on the sky examining this phenomenon. A little over 10 years ago a team of astronomers using the Very Large Telescope in Chile also measured and examined the arc and reported the distant galaxy seems to be more than three times brighter than those previously discovered. However, there’s more to the picture than meets the eye. Original images show the magnified galaxy as hugely distorted and it shows itself more than once in the foreground lensing cluster. The challenge was to create a image that was “true to life” and thanks to Hubble’s resolution capabilities, the team was able to remove the distortions from the equation. In this image they found several incredibly bright star-forming regions and through the use of spectroscopy, they hope to better understand them. According to popular theory, stars are created in regions similar to Cygnus X. As their lives progress, they drift away from each other and it is surmised the Sun once belonged to a stellar association formed in a slightly less extreme environment. In regions like Cygnus X, the dust clouds are characterized with deformations caused by stellar winds and high radiation. The massive stars literally shred the clouds that birth them. This action can stop other stars from forming… and also cause the rise of others. Thanks to Spitzer’s infra-red data, scientists are now able to paint a clearer picture of what happens in dusty complexes. It allows astronomers to peer behind the veil where embryonic stars were once hidden – and highlights areas like pillars where forming stars pop out inside their cavities. Another revelation is dark filaments of dust, where embedded stars make their home. It is visions like this that has scientists asking questions… Questions such as how filaments and pillars could be related. “We have evidence that the massive stars are triggering the birth of new ones in the dark filaments, in addition to the pillars, but we still have more work to do,” said Hora. Original Story Source: NASA Spitzer News Release. If you have a large telescope and an appetite for nebulae, then you’ve probably seen the Pac Man Nebula. Located 9,200 light years away in the constellation Cassiopeia, NGC 281 (RA 00 52 59.3 – Dec +56 37 19) is a seasonal favorite… and in this new image it’s showing a real “Halloween” face! Discovered in August 1883 by E. E. Barnard, this diffuse HII region is home to open cluster IC 1590, the multiple star HD 5005, and several Bok globules. To the eye of the amateur telescope, it’s a soft, round region with a distinctive notch that makes it resemble the PacMan of video game fame. However, when seen in infrared light by NASA’s Wide-field Infrared Survey Explorer, or WISE, the PacMan appears to have “teeth”! Of course, astronomers know these fanciful fangs are actually pillars where new stars are forming. They are created when stellar winds and radiation from the accompanying cluster blow away the gas and dust, revealing the dense star dough. If you see small red sprinkles in this cosmic cookie, then you’re looking at what could be very young stars in the process of springing to life. According to JPL News, this image was made from observations by all four infrared detectors aboard WISE. Blue and cyan (blue-green) represent infrared light at wavelengths of 3.4 and 4.6 microns, respectively, which is primarily from stars, the hottest objects pictured. Green and red represent light at 12 and 22 microns, respectively, which is primarily from warm dust (with the green dust being warmer than the red dust). It’s a great trick… or “treat”! The team recently published their results in a paper in the journal Monthly Notices of the Royal Astronomical Society. Apparently the environment that forms a particular group of stars plays a huge role in how many stars lead a lone existence – or have one or more companions. For the most part, star-forming nebulae produce binary stars in clustered groups. These groups then quickly disband into their parent galaxy and at least half of them become loners. But why do some double stars end up leading a solitary life? The answer might very well be how they interact gravitationally. “In many cases the pairs are torn apart into two single stars, in the same way that a pair of dancers might be separated after colliding with another couple on a crowded dance floor”, explains Michael Marks, a PhD student and member of the International Max-Planck Research School for Astronomy and Astrophysics. If this is the case, then single stars take on that state long before they spread out into a galaxy. Since conditions in star-forming regions vary widely in both appearance and population, science is taking a closer look at density. The more dense the region is, the more binary stars form – and the greater the interaction that splits them apart. Every cluster of stars has a different population, too.. And that population is dependant on the initial density. By using computer modeling, astronomers are able to determine what regions are most likely to contribute single stars are multiple systems to their host galaxy. Original Story Source: RAS News. For further reading: Notices of the Royal Astronomical Society. Animations of the interactions of binary stars. Astronomers have glimpsed into the birth of a star, and have seen what could be the youngest known star at the very moment it is being born. “It’s very difficult to detect objects in this phase of star formation, because they are very short-lived and they emit very little light,” said Xuepeng Chen, from Yale University and lead author of a new paper. Not yet fully developed into a true star, the object is in the earliest stages of star formation and has just begun pulling in matter from a surrounding envelope of gas and dust. The team detected the faint light emitted by the nearby dust. Using the Submillimeter Array in Hawaii and the Spitzer Space Telescope, the astronomers studied L1448-IRS2E, located in the Perseus star-forming region, about 800 light years away within our Milky Way galaxy. Most protostars are between one to 10 times as luminous as the Sun, with large dust envelopes that glow at infrared wavelengths. Because L1448-IRS2E is less than one tenth as luminous as the Sun, the team believes the object is too dim to be considered a true protostar. Yet they also discovered that the object is ejecting streams of high-velocity gas from its center, confirming that some sort of preliminary mass has already formed and the object has developed beyond the prestellar phase. This kind of outflow is seen in protostars (as a result of the magnetic field surrounding the forming star), but has not been seen at such an early stage until now. Other authors of the paper include Qizhou Zhang and Tyler Bourke of the Harvard-Smithsonian Center for Astrophysics; and Ralf Launhardt, Markus Schmalzl and Thomas Henning of the Max Planck Institute for Astronomy. The new study appears in the current issue of the Astrophysical Journal. Our Milky Way churns out about seven new stars per year on average. More massive stars are formed in what’s called H II regions, so-named because the gas present in these stellar nurseries is ionized by the radiation of the young, massive stars forming there. Recently-discovered regions in the Milky Way that are nurseries for massive stars may hold important clues as to the chemical composition and structural makeup of our galaxy. The announcement of these newly discovered regions was made in a presentation today at the American Astronomical Society meeting in Miami, Florida. The team of astronomers that collaborated on the search includes Thomas Bania of Boston University, Loren Anderson of the Astrophysical Laboratory of Marseille in France, Dana Balser of the National Radio Astronomy Observatory (NRAO), and Robert Rood of the University of Virginia. H II regions that you may be familiar with include the Orion Nebula (M42), visible just South of Orion’s Belt with the naked eye, and the Horsehead Nebula, so famously imaged by the Hubble Space Telescope. For more information on other known regions (and lots of pictures), visit the 2Micron All-Sky Survey at IPAC. By studying such regions in other galaxies, and our own, the chemical composition and distribution of a galaxy can be determined. H II regions form out of giant molecular clouds of hydrogen, and remain stable until a collision happens between two clouds, creating a shockwave, or the resulting shockwave from a nearby supernova collapses some of the gas to form stars. As these stars form and start to shine, their radiation strips the molecular hydrogen of its electrons. The astronomers used both infrared and radio telescopes to see through the thick dust and gas that pervades the Milky Way. By combing surveys taken by the Spitzer Space Telescope’s infrared camera, and the Very Large Array (VLA) radio telescope, they identified “hot spots” that would be good candidates for H II regions. To further verify their findings, they used the Robert C. Byrd Green Bank Telescope (GBT), a sensitive radio telescope that allowed them to detect radio frequencies emitted by electrons as they rejoined protons to form hydrogen. This process of recombination to form hydrogen is a telltale sign of regions that contain ionized hydrogen, or H II. The location of the regions is concentrated near the ends of the central bar of the Milky Way, and in its spiral arms. Over 25 of the regions discovered were further from the center of the galaxy than our own Sun – a more detailed study of these outlying regions could give astronomers a better understanding of the evolution and composition of our Milky Way.